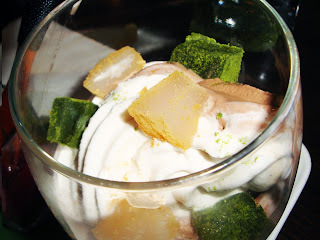 Feelings: I took MK to a vegan friendly dessert and tofu restaurant, Kyotofu in Hell's Kitchen. At 6:30pm on Thursday night, the place was quite crowded with young women enjoying their delicious dessert dishes and pretty cocktails. The waitstaff mentioned that it was happy hour, and all the cocktails were 50% off. If you are not much of a beer and nacho pub person, this would be a notable place to stop with your co workers for unique happy hour. We skipped drinks and went straight for the savory dinner dishes. MK ordered artisanal tofu salad with yuzu miso dressing. It came with a big smooth chunk of tofu that resembled boiled egg in the middle of salad. MK especially enjoyed the dressing and said the dish was quite unusual and unique. I ordered warm simmer tofu, which was steamed in a clay pot at the table, and it came with Japanese fixings such as tsukemono (Japanese pickles). I scooped the warm and just barely cooked tofu with a tiny wooden spoon. It was just like butter melting in my mouth but a much healthier version. The smoothness of the tofu was a joyous luxury for my throat-- it went as smooth as Japanese bullet trains. So fast and airy, without a single bump. The fresh nutty taste of tofu remained on my palate, and I begged for the next scoop. 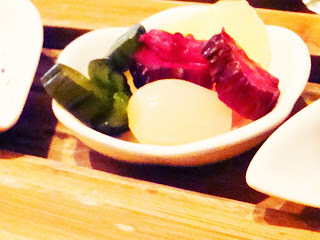 The saltiness of the tsumekono complimented the nuttiness for an exciting and intense flavor. For dessert, we both ordered the non dairy soy milk soft ice cream sundae! MK and I don't and can't eat dairy, so a vegan ice cream sundae is something we always dream of. The deconstructed sundae came with fluffy kuromitsu non dairy whipped cream, mixed berry compote, and soy ice cream with matcha mochi. Each element had amazing texture and flavor, and I did not want to mix them all! I wanted to enjoy every taste. 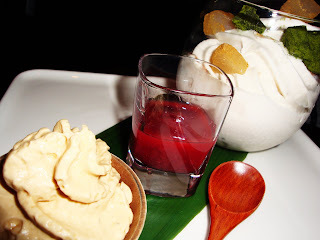 I especially enjoyed the kuromitsu whipped cream, and I wanted to buy a tub of it. The service is often slow here, but it is perfect if you want to relax, catch up with your friends, sip a cocktail, and enjoy every flavor and texture. Take your time and enjoy your tofu. 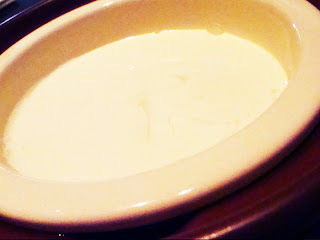 I also love...kyotofu! Great photos. Their soft serve w/ mochi is amazing. penny, now im craving tofu and mochi..